Adelaide's showpiece Riverbank Bridge provided the perfect backdrop to welcome one of the world's most iconic automotive brands to South Australia for the Ferrari Asia Pacific Challenge Series, which lines up on the 2015 starting grid for the first time. An incredible 30 Ferrari 458 Challenge Evo's will roar around Victoria Park as the first ever fully accredited FIA Race Series for sports cars in Adelaide. It won't just be the on-track cars turning heads however, a cavalcade of more than 150 Ferraris is expected to descend on Adelaide along with a public display featuring various Ferrari Supercars. 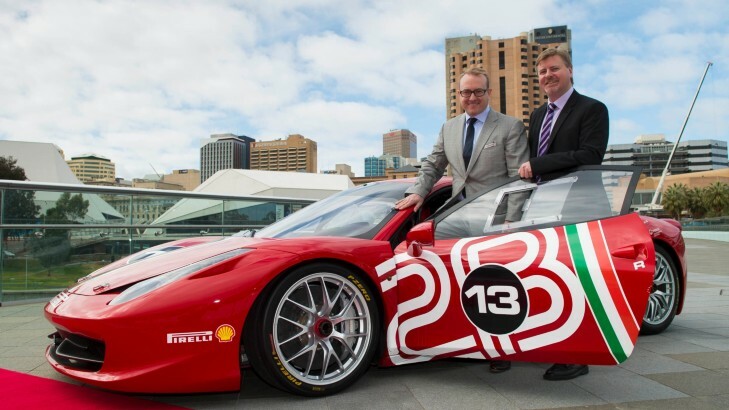 Tourism Minister Leon Bignell says it's going to be a boon to both international and national tourism, with Ferrari lovers descending from all over the nation to witness this one off event. Clipsal 500 CEO, Mark Warren, says it is an exciting coup for the event to secure the world's best known automotive brand as part of the 2015 racing schedule. "Never before have we seen such a collection of Ferrari race cars in South Australia. The sound of 30 V8's, roaring around the iconic Clipsal 500 street circuit is sure to turn heads," Warren says. "We certainly feel very honoured. The Ferrari Challenge only competes at top tracks in Asia and the fact they've chosen the Clipsal 500 is testimony to the prestige of our event, which is considered one of the best touring car events in the world." The showcasing of Ferraris will be a South Australian first and will be headlined by the LaFerrari - the world's most exclusive and sought after hybridsupercarbuilt byFerrari and worth $3 million. The one-off display will be a significant attraction in its own right and a once in a life-time opportunity for car enthusiasts to see it up close. The Ferrari Challenge Series will comprise of two practice sessions on Thursday, two qualifying sessions on Friday and a race each day on Saturday and Sunday at Clipsal 500. Ferrari Australasia CEO Herbert Appleroth says it was an easy decision to make to bring the category to Adelaide. "We were very keen on giving the motorsport fans in South Australia and beyond the chance to see the world's best one-make race category again on home soil," Appleroth says. "We are excited to partner with Clipsal 500 to bring the first round of the Ferrari Asia Pacific Challenge Series to Adelaide for the very first time and to have it part of such a well-respected and iconic Australian motorsport event."